For the measurement of rotary movements, rotational speed and position sensors form a unit together with target wheels. Especially on spindles for machine tools, the sinusoidal output signals are highly interpolated. To obtain optimal output signals, target wheels must be manufactured with high precision for this application. Only in this way can the output signals from the sensors be generated in the necessary quality. High precision standard target wheels made of ferromagnetic steel with module 0.3, 0.5 and 1 are available ex-works on short delivery times. MiniCoders scan target wheels with module 0.3; 0.5 or 1. Square-wave signals with 5 V DC, 10...30 V DC or 1 Vpp signals (sin/ cos-shaped track signals) are generated as output signals. The target wheels are optionally equipped with a reference flag, a reference groove or a reference tooth. 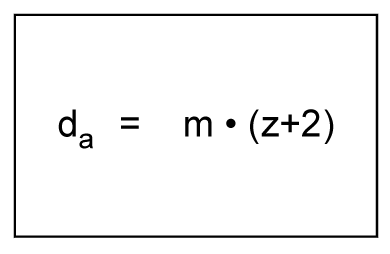 Depending on the version or position of the reference mark, a different MiniCoder variant is used to ensure a defined position for the reference signal in relation to the track signals. Size, inside diameter and design of the target wheel define the strength and the maximum permitted rotational speed. In your enquiries please state the maximum rotational speed at which the related target wheel is to be used. We will then assess the feasibility. In certain cases we undertake calculations using the FEM(1). Depending on the application and sensor used, target wheels with different modules are used. 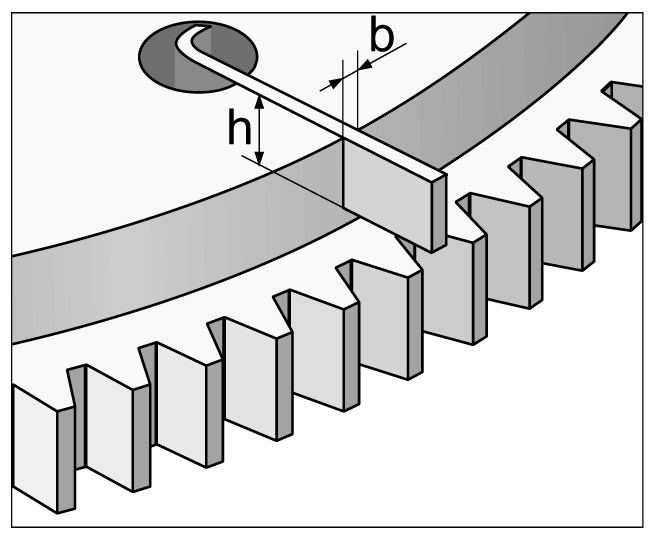 The module is a tooth parameter for tooth wheels and describes the relationship between the number of teeth and the pitch circle diameter of the tooth wheel. 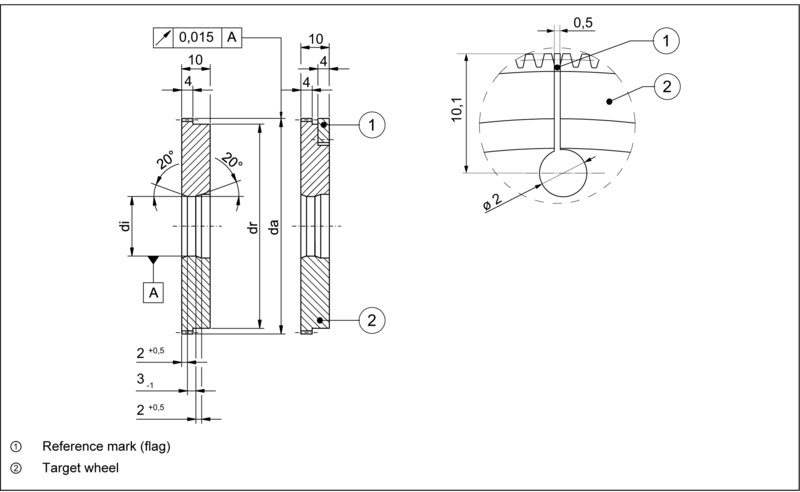 For the majority of applications the amount of space available is limited, here the outside diameter is crucial. 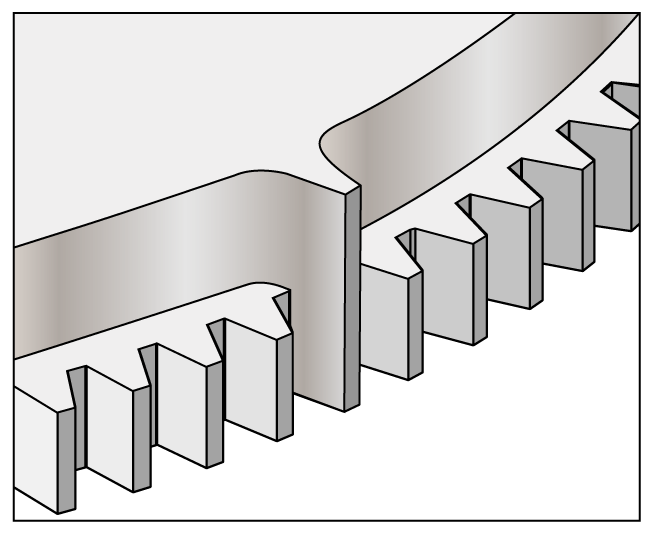 Given the same number of teeth, the smaller the module the smaller outside diameter. Reference marks can be designed as a tooth, groove or flag. The flag must be made of ferromagnetic material and must not protrude beyond the tip circle of the target wheel. 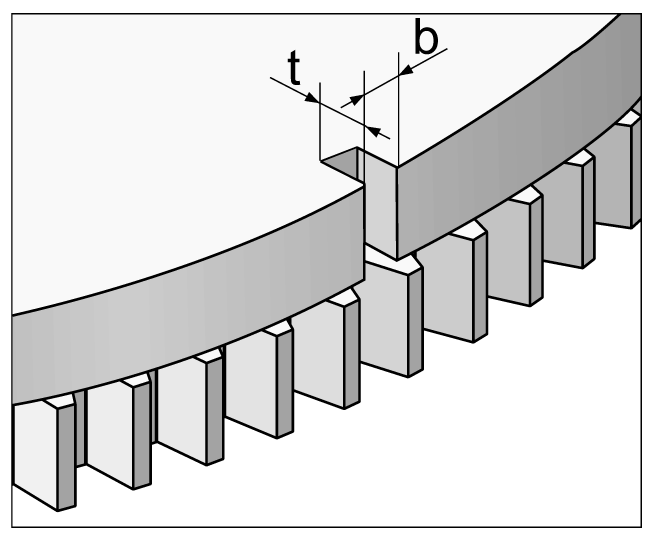 The selection of the reference mark is defined by the size and rotational speed of the target wheel used, as both parameters have an effect on the forces acting on the reference mark. In case of new designs we recommend the usage of a target wheel with reference mark variant "Z". The target wheels are marked with item number and serial number. 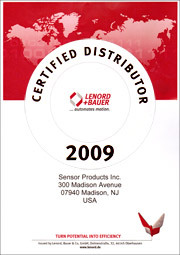 Upon customer request Lenord + Bauer will manufacture your target wheels to your specific requirements. Please send us a design drawing of your target wheel (if possible as a dxf file) toinfo@lenord.de. 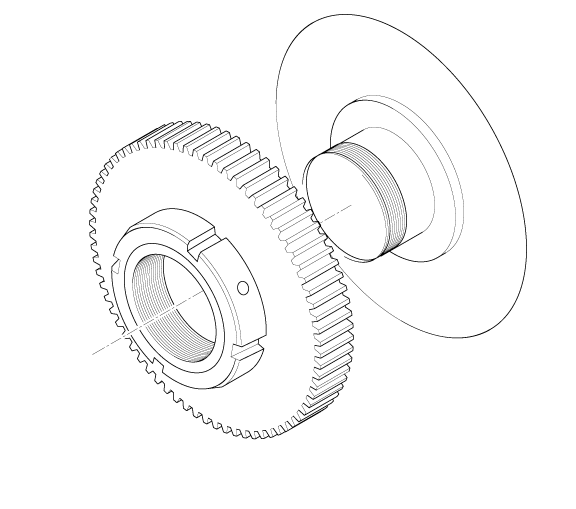 With this method the target wheel is not manufactured to exactly fit the shaft, instead the inside diameter is made slightly smaller. 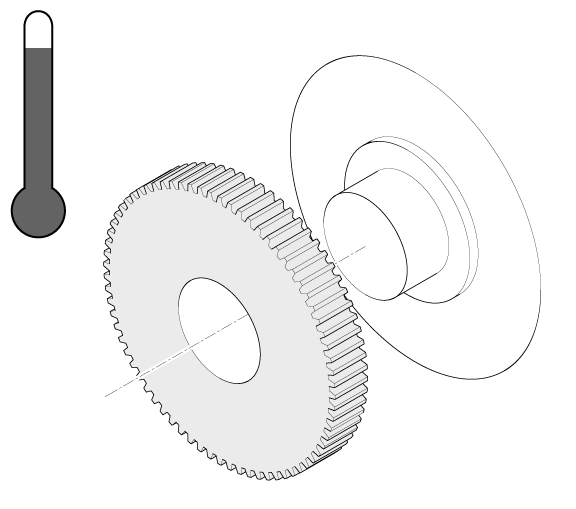 The target wheel cannot be fitted to the shaft at normal temperatures. By heating the target wheel the material expands and can be pushed onto the shaft. As the target wheel cools it shrinks and is pressed firmly onto the shaft. 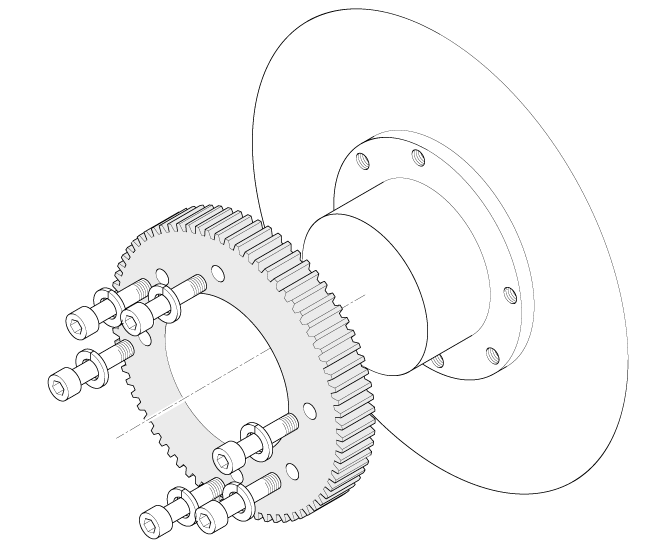 The target wheel is pushed onto the shaft and fastened to the shaft shoulder using screws. The target wheel is pushed onto the shaft and pressed against this component using a shaft nut. 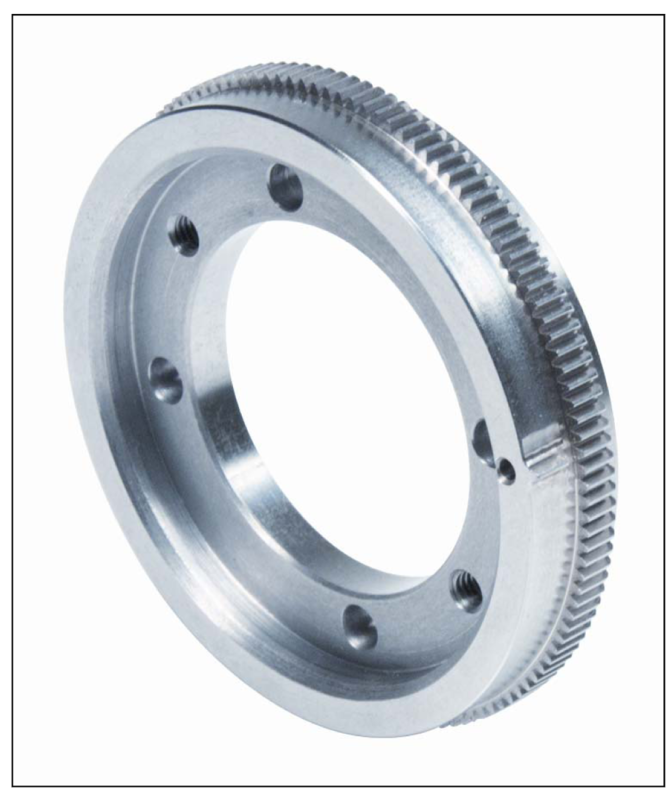 Upon request the target wheel can also be equipped with an integrated shaft nut, for this purpose a corresponding thread is cut on the inside diameter. For special applications feather keyways on the inside diameter of the target wheel provide protection against twisting.